Eeek! It’s October. Are you researching Apples of Uncommon Character? Telling ghost stories, dreaming about New England road trips? 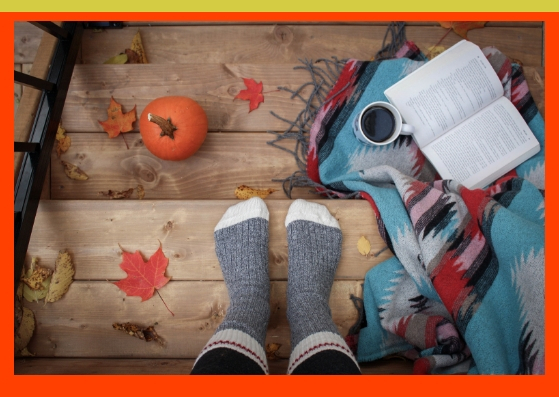 We at the library are focused on a wide range of autumnal themes. 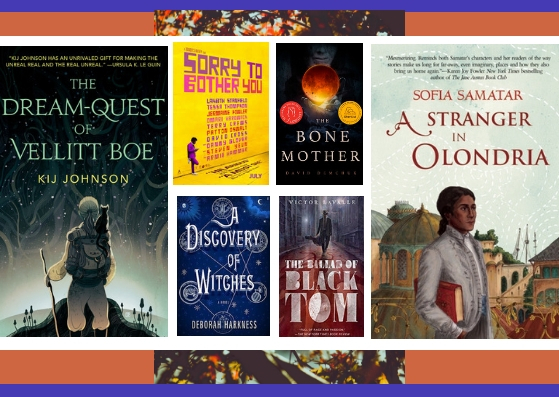 Here are October’s staff picks—inspired by the changing of seasons, the crisp smell of fall, scary stories, thrillers and fantasy, bright foliage, and thoughtful looks at the mysteries of life and death. This month will always make me think of the iconic 1985 CBC Anne of Green Gables miniseries starring Meghan Follows and Colleen Dewhurst. This might seem like an oddly specific association, but I grew up watching Anne and Diana stroll through the fields and forests of Prince Edward Island, brilliant foliage filling the screen, and ever since it’s been held in my heart as an ode to autumn. The series captures the unique, dramatic seasons of the Northeast with real love and depth, not only in terms of photography but thematically as well. 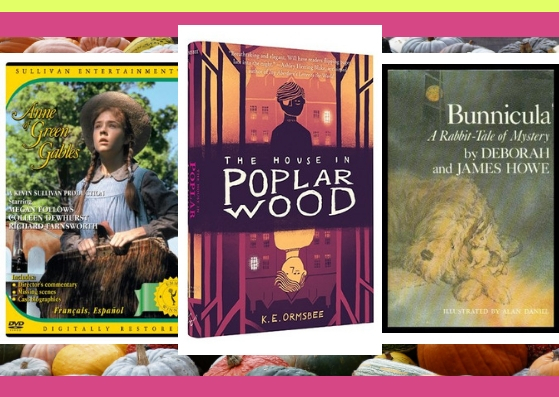 The original 1908 novel by Lucy Maud Montgomery handles change, loss, growth and new beginnings, through the eyes of a resilient and precocious girl you can’t help but love. PPL has this series in our DVD collection, as well as many subsequent sequels. Of course we have the classic novel and, amazingly, a new graphic novel adaptation by Mariah Marsden in the children’s library! As the seasons change it is really sweet to see Anne (with an E) being introduced to a new generation of kindred spirits. “Chores completed, Felix stood on the back steps of Poplar House. He watched at a distance, taking in a scene by halves: through his left eye he saw his father, and through his right he saw only a gentleman, dressed in black. The two men were shaking hands in the pink morning sun. The House in Poplar Wood, a middle-grade paranormal mystery by K.E. Ormsbee, is the perfect choice for the month of October! The Vickery twins, Lee and Felix, live in the same house, but separated on every day but Halloween. Felix and father assist Death, and Lee and mother serve Memory. This is the Agreement and it can never change. . .
Until Gretchen Whipple barges into their quietly repetitive lives with a bargain: if the twins help her solve the murder of a local girl, she will help them break the Agreement for good. It is a compelling and fascinating read, leaving you thinking about it when you aren’t reading, and totally focused when you are. Don’t miss this delightfully spooky page-turner! Deborah and James Howes’ books starring Bunnicula, the vegetarian vampire rabbit, were favorites of mine as a child in the late 1970’s, and about as far as I usually choose to go in the scary book category! Begin with Bunnicula: A Rabbit-Tale of Mystery: I was recently re-introduced to this fun little novel by some very literate baristas as the Congress Street CBD (if you stop in ask to meet Bunnicula!) and was compelled to revisit the entire series. Then a savvy library patron suggested that I listen to them on audio book and I was in for an even bigger treat! (The eAudiobook of the full series is also available to download from our cloudLibrary). Even if you are not an avid audio book listener I would suggest this as a great family listen together. The repartee between Harold, the dog, and Chester, the cat, is greatly enhanced by Victor Garber’s talented reading and the music and sound effects add to the suspense. Mystery, anemic vegetables, and the possibility of a vampire rabbit make this a “scary” book that is fun and lighthearted enough for the whole family. Read it on a dark and stormy October night with a pile of colorful root vegetables and your favorite furry friend. For slow burn thrillers (set in Maine! ), I recommend anything by local YA author Gillian French. I’ve read Grit and The Lies They Tell and devoured them both like a hungry zombie. 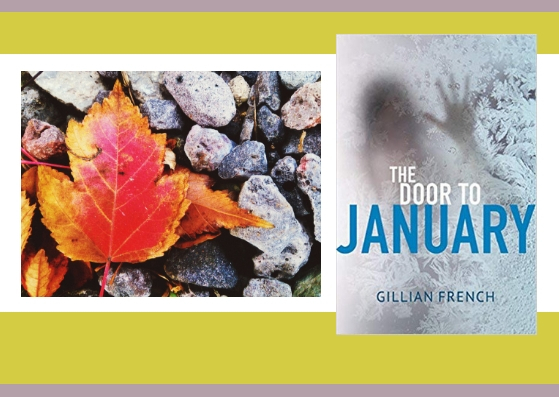 The Door to January is in my TBR pile! Grit is the winner of the 2017 Lupine Award in Young Adult Literature. If you’re looking for even more spooky teen reads, check out our beach-read list from August (oh so long ago! ): Chilling YA for Your Beach Day. My other pick for October is a zombie book, Zombie, Illinois, by Scott Kenemore. (Indeed this is about as far from my reading comfort zone as I have gone in many many many years). I will admit that I judged this book by its cover and title, but it did not disappoint. More than zombie apocalypse this book deals with the real frightening aspects of modern society: corruption, racial inequality, poverty, and class structure. There are zombies, and plenty of gory scenes to keep you on edge, but Zombie, Illinois is far more than just another zombie novel, it is a commentary on wealth and power run amok and who will be best prepared to deal with the collapse of so-called civil society. *Spoiler: alarm systems and your gated home on the North Shore will not protect you when zombies eat the mayor on live tv! I know I rarely have time to finish a novel these days, and I’m sure that others may feel the same so I’m focusing on short story collections (and one short novella). Richard Matheson (1926-2013) was an American Science Fiction and Horror author whose work has been adapted into film a plethora of times (most notably, I Am Legend, Duel, & sixteen episodes of The Twilight Zone). His work is a cornerstone of modern Horror fiction. This collection boasts an EXCELLENT forward by author Victor LaValle (author of the excellent Ballad of Black Tom). Kij Johnson’s The Dream-Quest of Vellitt Boe is a wonderful take on H.P. Lovecraft’s Dreamlands stories & includes many of the strange places and disturbing creatures featured in “The Dream-Quest of Unknown Kadath” but with a very different and refreshing approach to the material. It’s a marvelous book from an intriguing author. Ellen Datlow has edited great anthologies, including The Year’s Best Fantasy & Horror 2008 which contains one of my favorite short stories, “The Fiddler on Bayou Teche” by Delia Sherman. There are a bunch of great, hard-to-find, and/or unfairly obscure short stories tucked away in various anthologies in our collections. One that definitely deserves a mention is “Horrer Howce” by Margaret St Clair, which appears in the collection Galaxy, Thirty Years of Innovative Science Fiction (with a nice intro by the author herself). The Burbank Branch just received The Bone Mother by David Demchuk, a new collection of horror short stories centered around Slavic folk tales. Can hardly wait….! I shall read it by the light of a single candle. October is the perfect time to dive into Deborah Harkness’s world of All Souls. Her stories of witches, vampires, and demons started with A Discovery of Witches, which I devoured as an audiobook when it came out. Diana Bishop is a reluctant witch who inadvertently discovers an enchanted manuscript in Oxford’s Bodleian Library, attracting the attention of all the other magical creatures around her, including the imposing 1,500-year-old vampire Matthew Clairmont. I happily listened along to the next audiobooks in the trilogy, Shadow of Night and The Book of Life, which continued the story of Diana and Matthew and their families, adding in time-travel to Elizabethan London and back again. Harkness has created a rich cast of characters in a well-developed world that I happily jumped back into with her newest title, Time’s Convert. This story is focused on becoming a vampire, telling the story of Phoebe’s transformation in present-day Paris, and her future husband Marcus’s transformation during the American Revolution. Marcus and Phoebe both struggle with constraints around loyalty to family and their ideas of liberty, equality, and freedom. If you’ve already enjoyed the first three books and are ready for more magic, dive in! And if you’re new to Harkness’s world, start with A Discovery of Witches and enjoy hours of fantastic reading as you ease into fall. 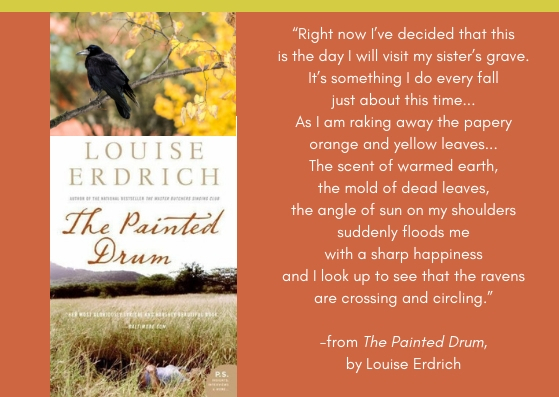 Louise’s Erdrich’s 2005 novel The Painted Drum roams through each season and tells many stories, but it begins and ends with a woman in a cemetery in New England, settling its complex world down at last in a luminous fall. It is a book I’ve read and re-read. From our newer collections: Ling Ma’s 2018 post-apocalyptic satire Severance packs plenty of thrilling, anxious moments, along with deadpan humor and a nuanced commentary on capitalism, love, loss, tyranny, and what it means to truly stay alive. I rooted hard for Candace Chen all the way to the end. If you‘re looking for a great intriguing-atmospheric-mystery-with-ghosts-set-in-a-small-village-in-Ireland this fall, Jess Kidd’s novel Himself should do the trick. And director Boots Riley’s Sorry To Bother You is at the top of the heap of the best films labeled fantasy that terrifyingly mirror reality. Set in a fantasy world of author Sofia Samatar’s imagining, A Stranger in Olondria tells the story of the life of Jevick of Tyvom, the son of a pepper merchant from a tropical island rich in oral history but without any written language. Taught by a foreign tutor, Jevick learns to read and write and grows up fascinated by the books and people of the country of Olondria across the sea. When his father dies, Jevick takes his place on the yearly selling trip to Olondria, and becomes even more enraptured with the culture and stories there. At an Olondrian festival, Jevick’s life is pulled off-course when he becomes haunted (literally) by the ghost of a girl from his homeland, who demands that he tell her story. This haunting, which has a visibly traumatizing effect on Jevick, pulls him into the religious and political machinations of Olondria, a country divided in its beliefs in a way Jevick had never pictured in his idealization. It is Autumn, season of dazzling foliage, apple pies and bluer-than-blue skies. We’re looking at frost warnings, dusk’s descent at drive-time and my least favorite activity after snow shoveling: raking. Life winds down, sharply contrasting with the busting out all over of Spring and Summer, heading toward Winter’s icy interval. I found Sallie Tisdale’s 2018 book Advice for Future Corpses (and Those Who Love Them): A Practical Perspective on Death and Dying excerpted in an issue of Tricycle magazine serendipitously snagged for lunchtime reading. I wanted more. At the time it wasn’t available for loan locally, nor was it borrowable through my go-to resource and (coincidentally) my daily workplace, Interlibrary Loan. I did the unthinkable. I bought my own copy. In Advice for Future Corpses, Tisdale shares her compassionate observations of life’s end, gleaned from personal and professional experience as an oncology nurse, palliative care practitioner, Buddhist teacher, accidental bystander, daughter and friend. Sometimes funny, occasionally brilliant, never precious, she is unflinching in explaining what I have always been too polite ask about bodies lurching toward death. What happens when they get there … and what do we do with what is left behind? She talks about how we die: with piercing suddenness or excruciating slowness; in spite of our efforts or initiated with intent. She digs into the plans that we can make, the legal paperwork that we can see to and, separate from that, the sought after control that simply isn’t part of the deal: the inevitability of it, the “not if, but when” of death. She looks at the cultural weight brought to bear on death and dying, burial customs and practices. She speaks of and to caregivers. She explores the myriad shapes of grief and mourning. This suits my sense of season, both on the calendar and in life. It is Autumn in every sense. As I settle into seasonal slowing down time, I will come back to Advice to Future Corpses (and Those Who Love Them.) There is much to sate curiosity and sustain deep thinking, the kind that I manage best when days grow shorter and endings seem rhythmic and reasonable. As always, thanks for reading our Staff Picks. If you’re looking for other reading recommendations tailored specifically to your own interests (cookbooks, 18th century travel narratives, contemporary poetry, hidden gems, social justice, you name it), head to our Your Next (Great!) Read page to learn more and fill out a very short form on what you’re in the mood to read next. We’ll send you a list of ideas that links directly to the library’s catalog so you can place holds easily.